Written especially for investors who have some familiarity with the option market, this comprehensive reference also shows you the concepts and applications of various option strategies—how they work, in which situations, and why; techniques for using index options and futures to protect one’s portfolio and improve one’s return; and the implications of the tax laws for option writers, including allowable long-term gains and losses. Detailed examples, exhibits, and checklists show you the power of each strategy under carefully described market conditions. Also available is the Options As A Strategic Investment Study Guide. With reading assignments and quizzes, this study guide will help ensure that you've grasped the key concepts of each chapter. "The options world has a lot to offer investors and traders alike, but it can be dauntingly hard to understand. Since its original publication, Options as a Strategic Investment has answered many a question; and each succeeding edition has answered many more. It is the options reference in our office." 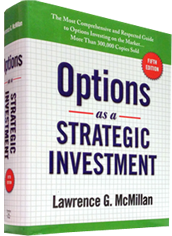 "Larry McMillan's Fourth Edition of Options as a Strategic Investment is a must read. This latest version of his original classic presents his latest thinking on options. McMillan is truly the master of his field." "Larry's book is the bible of the options community. It has established the benchmark by which all other option books are compared - and none measure up." "Larry has taken options education into the 21st century with this book. His insights into trading concepts will always stand the test of time. Keeping up with the latest information on options is mandatory and no one does it more masterfully than Larry." "The options product is the premier tool for managing risk, but most professionals are no longer taught about it, and individual investors shun it because of its supposed complexity. Mr. McMillan not only makes this risk management tool easy to understand, but fun to learn. Did you realize that if you own a car you own a put? Read the book and find out how you are already using options as a risk management tool without realizing it. This book should be read by everyone - professionals and individual investors alike." "The best one-stop source of understandable option information that you can act on immediately. Every serious investor should read this book." Ken and Daria Dolan - Heard daily across America on the WOR radio network. "Mr. McMillan is well established as the leading authority on options trading and information. His contributions to this body of information are well documented and acknowledged by professionals thought the securities industry. This book is an important part of any serious trader's library. I highly recommend it to both inexperienced and experienced option traders alike." "One of the first gifts I received when I started working on a trading desk for an arb fund was your book Options As A Strategic Investment. It has been invaluable, you write very clearly and to the point. As a neophyte who had just passed the series 7 and working on the series 4, most books on options would have been absolutely overwhelming. Your book presents a clear progressive education on the topic and it is a constant resource." Owning a Call for "Free"
Part II: Pructs Designed to Provide "Income"
Why Does Volatility Reach Extremes? Strategy Considerations: Using the "Greeks"
Chapter 43 - The Best Strategy? *Free shipping discount can only be applied to full-priced domestic orders of the "Book Only" option. Does not apply to the Study Guide or package.